The Vermillion Public Transit system is on time, and on the money, making it easy to get around town on your own and achieve whatever your job or life demands. 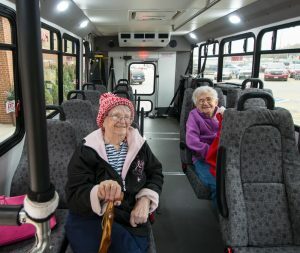 This system serves the community of Vermillion and its surrounding area, with seven buses providing nearly 400 different customers with more than 5,000 rides per month. For routes, schedules and more, call 605-624-RIDE. * If you are over 60 and cannot afford the fare, contact our office to discuss your options. We schedule rides on a first come, first serve basis, so plan to schedule rides as far in advance as you can. We encourage you to schedule your rides at least one day in advance. This helps us to plan for the trip when we make our schedule for the next day. We also recommend that you schedule your ride so there is enough time to get to your destination on time. Buses may arrive 10 minutes before your scheduled pick up time or 10 minutes after the time, so we encourage you to plan accordingly. We ask that you plan to schedule your return trip at the time you make the initial ride with the dispatcher. To schedule a ride, call 624-7433 during office hours. Office hours are: Monday – Friday 8:00am – 12:00pm and 1:00pm – 5:00pm. There is no one in the office between 12:00pm – 1:00pm. Please call to schedule rides before or after this time. The cell phone (202-0954) can be called during this time to request a pick up over the lunch hour, but no advance scheduling can be done. Customers who are deaf, hard of hearing or speech impaired can receive assistance through Relay SD by dialing 711. To schedule a ride, call 624-7433 during office hours. Office hours are: Monday – Friday 8:00am – 12:00pm and 1:00pm – 5:00pm. There is no one in the office between 12:00pm – 1:00pm. Please call to schedule rides before or after this time. The cell phone (202-0954) can be called during this time to request a pick up over the lunch hour, but no advance scheduling can be done. Are you interested in advertising on our buses? Business owners can purchase ad space on transit vehicles. Price varies based on size of the ad. Please contact the office, 605-624-7433 for more information. We sell Jefferson Lines tickets in our office at 604 ½ High St., Vermillion, SD. Safe Ride is a program sponsored by the University of South Dakota to provide late night rides on Friday and Saturday evenings during the University school year. VPT provides the bus and driver for this program. This is a free service for participants.